BAA! What better way to use up some of your wool than with a sheep! Or, even better, a whole herd of them. Andy the sheep’s body is constructed with fun bobble stitches, giving him some great texture, and his big floppy ears make him super sweet (and a little goofy!). This little guy measures approximately 5.5 inches long when using worsted weight yarn. The pattern includes detailed instructions and step-by-step photos, plus you can contact me along the way to ask any questions. 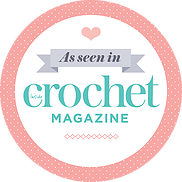 It is an intermediate level pattern that involves starting with a magic ring, chain stitch, single crochet, half double crochet, double crochet, triple crochet, increasing, decreasing, attaching pieces, and working through back loop only. Note: If you are making this amigurumi for someone under 3 yrs, I recommend crocheting or embroidering the eyes instead of using the plastic safety eyes.